At the breaking out of the war in North America, in 1754, Lieutenant Colonel Stewart was appointed a Captain in a regiment, raised by the King’s orders, in Virginia, with positive assurances, from the Governor of that province, that his Majesty’s Royal intentions were, to put this corps upon the establishment of the army; and in the space of forty days he brought to the place of rendezvous 173 able-bodied men, which was more than any three officers of that regiment could accomplish. The very great difficulty, and expense, of enlisting men in a country thinly inhabited, and where almost every inhabitant is a land-holder, cannot be conceived usless by those, who had a local knowledge of America at that time. In 1755, he was appointed Captain Commandant of a troop of light-horse, which he also raised, at a very heavy expense, with unusual dispatch. At the battle of Monongahela, Lieutenant Colonel Stewart had the honour to remount General Braddock four times; and after the General had received a mortal wound, and the debris of the army had retreated, he had the good fortune, assisted only by four private men of his own troop, under heavy fire, to carry His Majesty’s Commander in Chief off the field of battle; and thereby, rescuing his person, from the barbarous insults of a cruel and savage enemy. This conduct induced General Braddock, in his last moments, to recommend Lieutenant Colonel Stewart to his successor in command, and to the Governor of Virginia, in the strongest terms. As soon as the operations of the campaign of 1756 would permit, he had the honour to attend Governor Dinwiddie to head quarters, who introduced him to the Earl of Loudoun, and, at the same time, delivered to his Lordship, the last, dying request of the late General Braddock, in his favour. 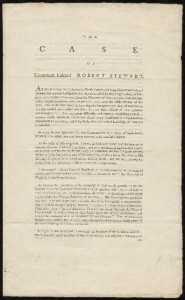 His Lordship was pleased to say, that, “he would pay every attention due to so honourable a recommendation;” and he thought proper, likewise, to declare, in the presence of Governor Dinwiddie, that “he had directions from his late Royal Highness the Duke of Cumberland, to raise a troop of light horse, upon the British establishment, and to give the command of it to Lieutenant Colonel Stewart.” But, unfortunately for him, his Lordship was recalled, before the nature of the service would admit of this measure being carried into execution. In 1757, he was employed in covering the frontiers of the Southern colonies, which proved a most harassing service to the troops, not only from the nature of the country, and extent of the command, but also from the perpetual incursions of the French and Indians. In the campaign of 1758, when Fort DuQuesne was reduced, he had the honour to be appointed to the command of three troops of light horse; and was, likewise, Major of Brigade to General Forbes. He served the four following campaigns as Major and Lieutenant Colonel, of the Virginia regiment under Generals Stanwix, and Monckton, from whom, as well as from all the other Generals, under whose command he had the honour to be employed, he received the most flattering testimonials of approbation; yet, at the conclusion of the war, he found himself reduced a lieutenant Colonel, without either rank or half pay, although he had been expressly promised both, when he first entered the service, in which he had sunk the whole of his private fortune. And, it might be adduced as an additional circumstance in favour of his pretensions, that he relinquished a very lucrative situation, under an entire persuasion, that he had obtained a permanent footing in the army. 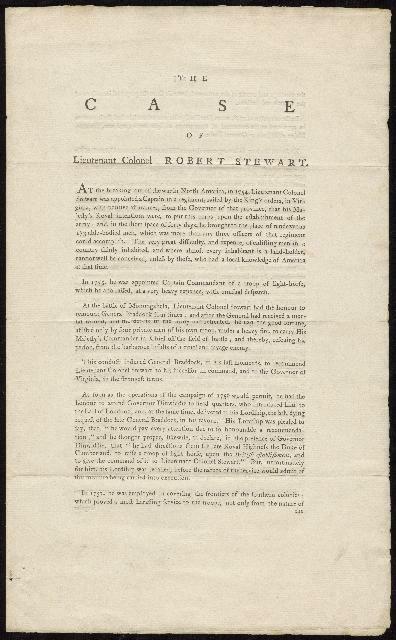 At a juncture, when the public attention is drawn to the claims of those provincial officers who served last war in America, Lieutenant Colonel Stewart begs permission to recal (sic) the attention of His Majesty’s Ministers, to his own claim, of a much older date; by observing, that the pretensions of the regiment, in which he had the honor to serve, during the former war were essentially different from those of any other provincial corps whatever, inasmuch, as the officers in that regiment were promised, in his Majesty’s name, that they should have established rank and half pay, and the private men were entitled for life; whereas, all other provincial corps have either been levied and disbanded annually or have been raised only for some limited period, without such previous stipulations. Lieutenant Colonel Stewart is the only officer of the Virginia regiment unprovided for, who attached himself to the King’s service, and consequently, from his singular situation, the granting him the rank and half pay, which he was so long since entitled to, under the public faith, pledged to him by the Governor of Virginia, can occasion no claim from any other quarter or afford a precedent to any other claimant. If the conditions, upon which he entered into His Majesty’s service, had been fulfilled to him, he would have enjoyed the established rank of Lieutenant Colonel near twenty-three years ago; of consequence, he would, at this time, have stood upon the list of Lieutenant Colonels in His Majesty’s army; and, if the advantages, which would probably have accrued to him, from such high rank, in the common course of service during this long period were to be considered his loss must appear almost inestimable.